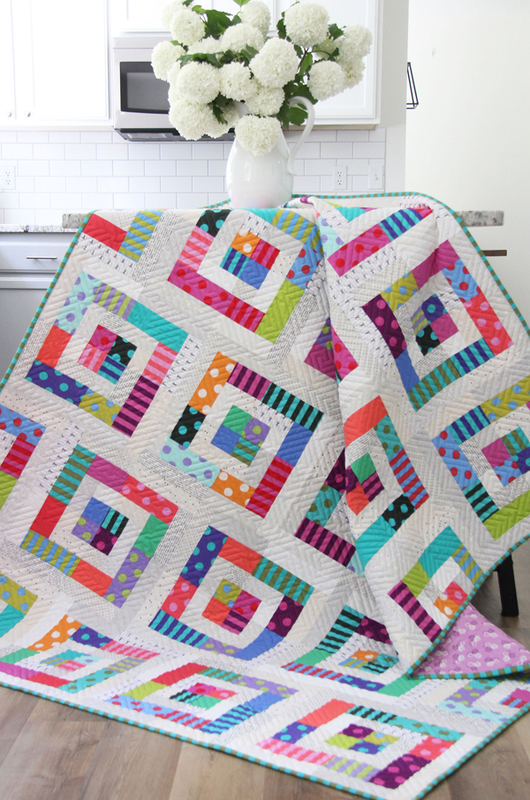 Today I get to share my Color Pop quilt…and it’s definitely a pop of color! This one is a jelly roll pattern in 5 sizes, and also uses some neutral low volume background fat quarters. Aren’t these white flowers so beautiful?! I cut them from a PeeGee hydrangea tree in our yard. 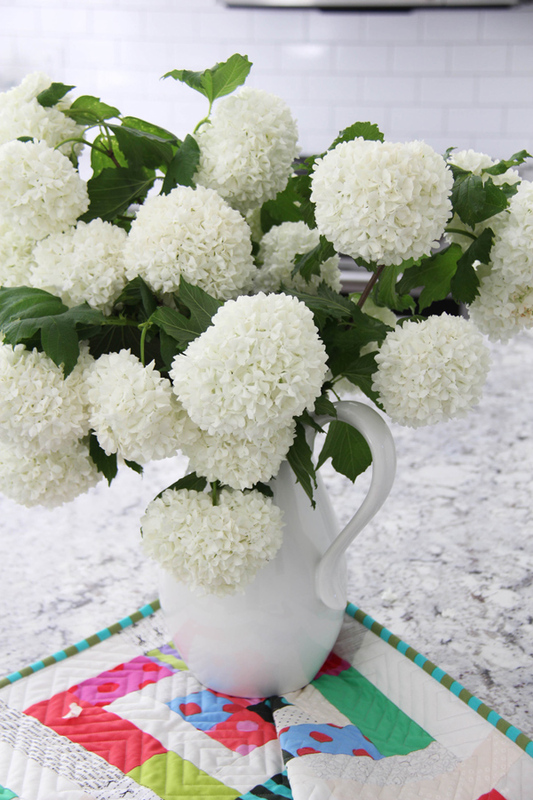 It’s so beautiful overflowing with these flowers the whole month of May, we call it our pom-pom tree. I used a jelly roll of the Tula Pink All Stars Coordinates for this quilt. The colors and dots/stripes are perfection. Kaitlyn quilted this with this modern geometric pattern. I love the density of the quilting on a simple quilt like this. I pieced the back of this quilt with some purple pieces of my Hello Jane fabric line and the binding is from the All Stars coordinates collection. 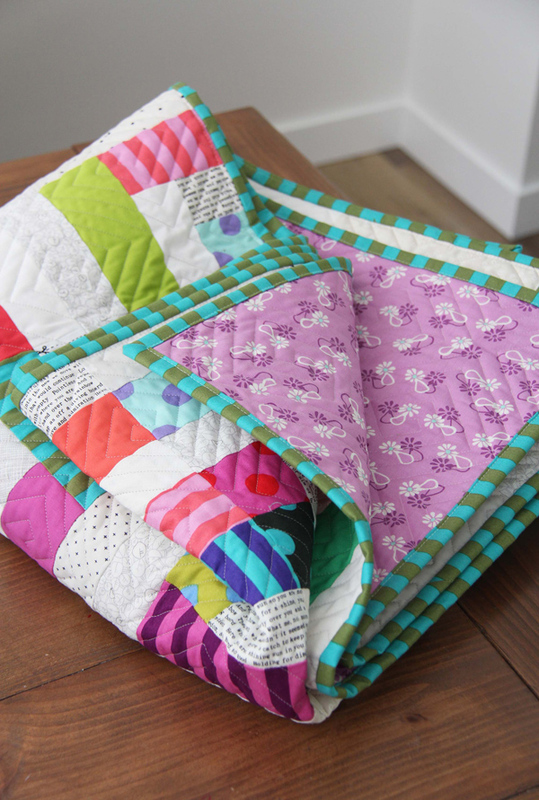 Thank you for being patient with all of my new pattern posting…and happy quilting! What a beauty! <3 it! They are the most beautiful colors in her fabric! Too cute – I have one similar in my bucket list – but I like yours better! That is the story of my life! ;) I always like other people’s quilts better! Thank you! Your designs are always so gorgeous! Thanks for sharing. 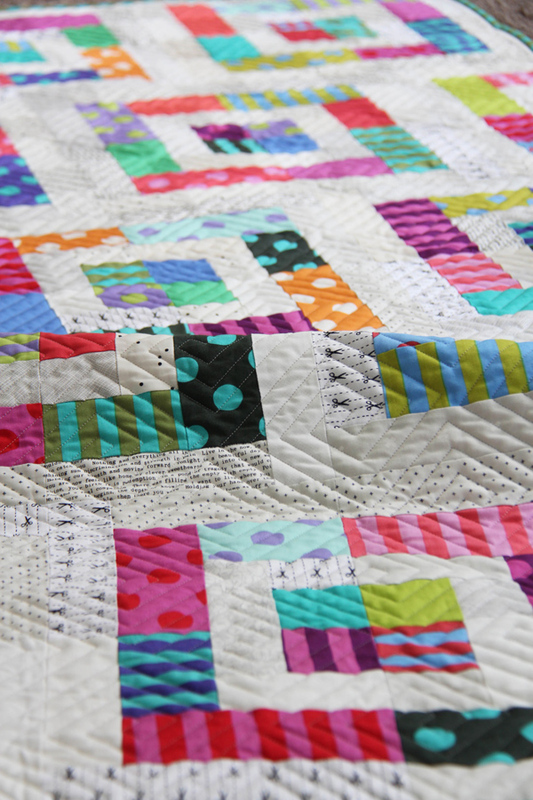 Beautiful quilt … thanks for sharing ! Love this ! Love it! 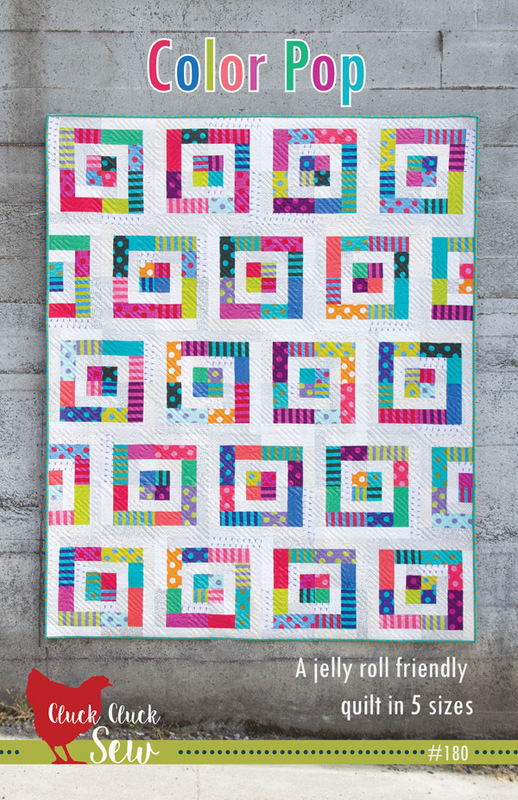 Beautiful quilt with all the bright pop-of-color fabrics! It is a very happy one! I love the low volumes you used in this too. That is something I don’t have in my stash and not sure how to get started. Can you give me some tips? I love all your patterns and your Hello Jane fabrics. All your patterns/quilts are so happy. Hi Linda! I just started buying more low volume print too…I love color so I tend to only buy color prints! For low volumes I like any white or off white background, with a small/thin print in a color like black, gray, or navy blue. The Moda lines by Zen Chic always have some great low volume prints mixed in: https://www.fatquartershop.com/catalogsearch/result/?q=moda+zen+chic There are also some really fabulous low volume fat quarter bundles on Etsy (link here: https://www.etsy.com/search?q=low%20volume%20fabric%20bundle&ref=auto2&as_prefix=low%20volume ) That’s the best way to get started with a fat quarter collection of low volumes! I hope that helps! 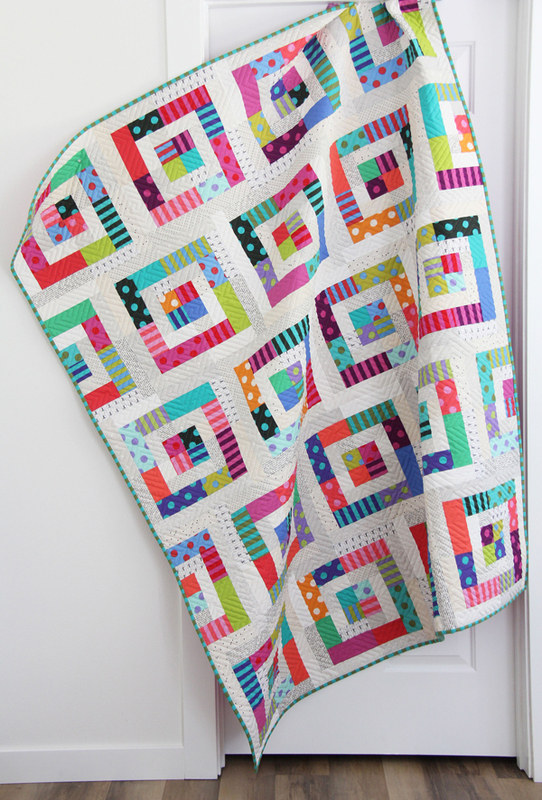 Really a great color pop in this quilt. Love it! I am enthralled by rows #2 and #4….love that they are offset. This is another winner, Allison! You are just like me….I love anything offset! Thank you! Oh I’m in love. 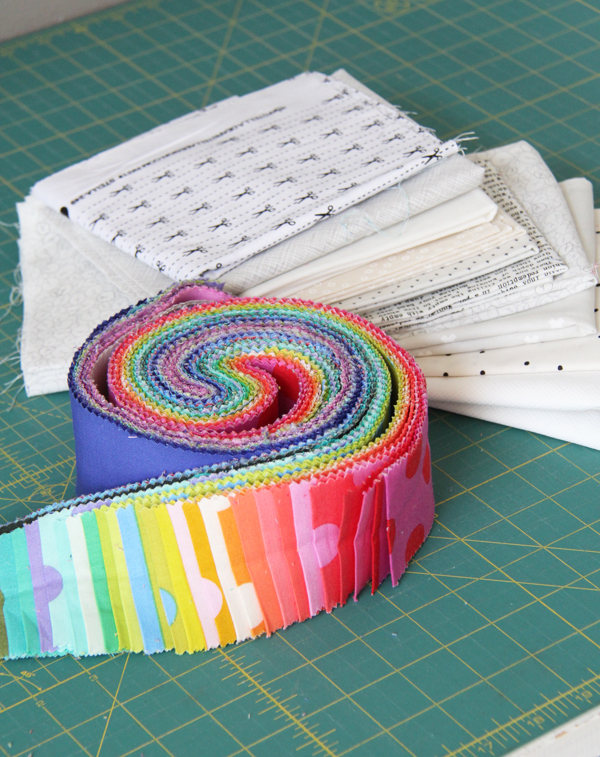 I have a jelly roll of this exact fabric and I didn’t know what to do with it, but this is exactly what I need to make!! Oh how funny!!! This is such wonderful fabric to work with!! Love! Love! Love! the colors! Just purchased and can’t wait to try it. I guess I missed your sale. Bummer! It’s still a bargain. Love your patterns and inspiration, Allison! Thanks for sharing! I’m emailing you the discount now! Thank you! Thank you for the refund, Allison! It certainly was not expected but was very appreciated. I thought the regular price was a bargain.